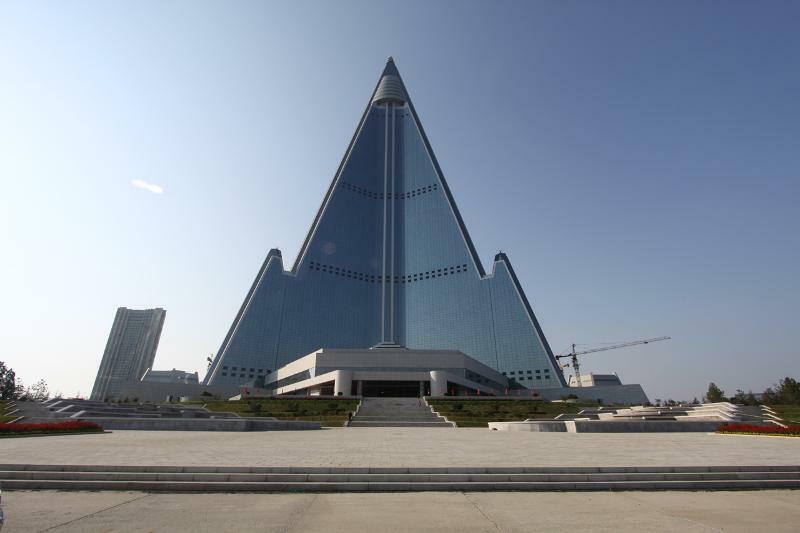 Is the world’s tallest building in North Korea? I have read that one of the tallest buildings in the world if not the tallest is a hotel in, of all places, Pyongyang, North Korea. My fragmented knowledge is that it was built after a South Korean company built the Petronas Towers in Kuala Lumpur and that it has never been occupied, despite the booming convention business in North Korea these days. But I never find it included in lists of tall buildings. Can you shed any light? At 300 meters (985 feet), the Ryugyong Hotel in Pyongyang — there’s a phrase to make your jaw sore — never came close to being the world’s tallest building. But it would have been the world’s tallest hotel, except for two problems: it was never completed, and even if it had been, somebody’s built a taller hotel elsewhere. Always the way in the “world’s tallest” sweepstakes. A monument to human vanity? Sure, but it’s hardly the only one, even on the Korean peninsula. As Hans Netten recounts in his amusing Web page at www.xs4all.nl/~hnetten/tallest.html, Seoul Tower, a modest 778 feet tall, once claimed to be the world’s tallest building by adding in the height of the mountain on which it stood. This mine-is-bigger-than-yours foolishness is hardly confined to the developing world. One famous instance occurred in the late 1920s, when the Chrysler Building and 40 Wall Street were under construction in Manhattan. As Paul Goldberger tells the story in The Skyscraper (1981), Chrysler had originally announced its building would top out at 925 feet, while 40 Wall, which had started construction sooner, was set for 927. But Chrysler architect William Van Alen, determined not to be outdone by his former partner, 40 Wall designer H. Craig Severance, designed the famous art deco spire and had it secretly assembled within the Chrysler structure, then hoisted into place at the last minute. Finished height: 1,048 feet. One can only imagine Chrysler’s bankers thinking, I can’t believe we trusted these morons with our money. Van Alen’s day of glory didn’t last long. The Mohawks hadn’t even finished riveting together the Chrysler’s steel before work began on the Empire State Building, which put its midtown neighbor in the shade by a margin of 202 feet. The twin Petronas structures were indeed taller than Sears Tower, but only by virtue of their decorative tops. The people at Sears, whose tower is pretty much building rather than froufrou all the way up (compare the profiles at http://www.history.com/topics/chicago/videos/americas-tallest-building-the-sears-tower), commenced a program of whining that ended in the Council on Tall Buildings and Urban Habitat declaring that henceforth there would be four categories of tallest building: (1) height to the structural or architectural top (by which reckoning Petronas is currently the tallest); (2) height to the highest occupied floor (Sears); (3) height to the top of the roof (Sears); and (4) height to the top of the antenna. Until recently, the holder of the title to (4) was the World Trade Center in New York. However, for purely practical reasons (really) the Sears people added 22 feet to one of their antennas in June, which means that at 1,730 feet Sears Tower is now two (2) feet taller than the World Trade Center. Thus the ST now leads in three categories out of four. Take that, Petronas. For a time an even taller structure threatened to put an end to this nonsense. The Shanghai World Financial Center, set to open in 2001, was to be 1,509 feet of solid building. But as so often happens, reality intervened, in the form of the Asian financial crisis, and the thing has yet to get out of the ground. A recent report says the building’s backers remain optimistic and are looking for additional investment to make the structure even taller. Uh-huh. In case you’re wondering, the world’s tallest hotel is currently the Burj al-Arab in the gulf emirate of Dubai, which measures 321 meters (1,060 feet). It stands on an artificial island, and suites there rent for up to $15,000 a night. Just the thing if they’re full up at Motel 6.